USA - San Clemente Island - The Navy discovered a significant prehistoric artifact 90 miles west of San Diego on San Clemente Island (SCI) located mid-island at a newly discovered archeological site. A boat effigy made of submarine volcano lava was spotted at the surface of the site during an archeology survey. The boat effigy represents a type of boat used by the California Indians who occupied the California Channels and adjacent southern California mainland at the time of the Spanish "discovery" in the 1500s. Dr. Andy Yatsko, Senior Archaeologist and Region Southwest Archaeologist for the Naval Facilities Engineering Command Southwest in San Diego, who has over 40 years experience in prehistoric and historic archaeology finds the boat effigy to be an uncommon find. The effigy was created from submarine volcano lava. This lava differs from the lava that flows on the mainland because the vesicles are smaller, making it more brittle and more difficult to handle. " The vesicle volcanic material used is hard and brittle but somehow they were able to craft a fine little carving out of it to represent an important part of their culture," said Yatsko. "This is something someone made representing a high skill level. This guy wasn't just a technician he was an artist. You can hold it and think about someone from 500 to 1000 years ago." BAHRAIN – Muharraq - Bahrain is stepping up efforts to protect its heritage. Culture Ministry teams have just wrapped up excavating a historical fort in Muharraq in what has been one of the busiest archaeology seasons in recent years. "The important things we've found in Bu Maher Fort were the architectural walls and elements," said archaeologist in charge Salman Al Mahari. "We are conserving the walls by conducting reversible reconstructions in order to link up the architectural elements and make the fort's parameters clear for visitors. "Some walls are too weak, so we had to add a lot of stones to stop them from crumbling. "We've also had to carefully remove palm trees that were in the middle of the fort and plant them outside the fort's parameters." One of the most important discoveries by the Bahraini team at the site was a small room known as a madbasa. "It is a common element in a lot of old Bahraini buildings," said Mr Al Mahari. "A madbasa is a room that is small and dark, that people used to store dates in baskets made from palm tree fronds. "The room has little pathways and the pressure and heat make the date syrup come out. "The floor is usually a little tilted to direct all the syrup to one corner where it is collected. "Date syrup was very important to the diet at the time, because it was their only source of sugar or sweetener." The fort, which is the first point on Bahrain's pearling trail, is expected to be open by the end of the year. TURQUIE – – Patara – Antalya’s Kas district’s Patara ancient site’s 25th year of excavation works have begun. The works will be ongoing for two months and will take place at the Basilica, the Liman Hamam, the Palestra, the Tepecik Acropolis and the Ancient Lycia Water way.. The city of Patara, along with the rest of Lycia, surrendered to Alexander the Great in 333 BC. During the Wars of the Diadochi, it was occupied in turn by Antigonus and Demetrius, before finally falling to the Ptolemies. Strabo informs us that Ptolemy Philadelphus of Egypt, who enlarged the city, gave it the name of Arsinoe after Arsinoe II of Egypt, his wife and sister, but it continued to be called by its ancient name, Patara. 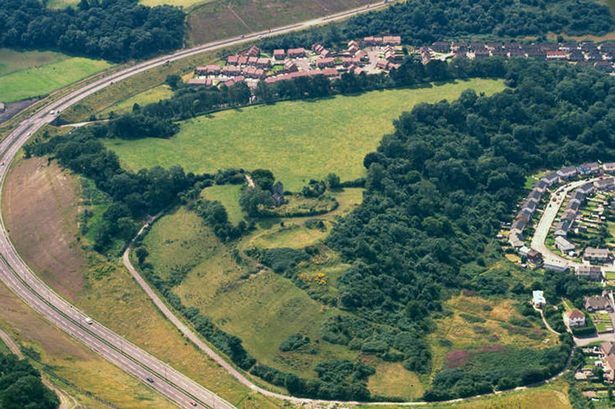 ROYAUME UNI – Caerau - New evidence has revealed that an ancient hillfort in Caerau was the powerhouse for the whole of Cardiff more than 2,000 years ago. Archaeologists working on the Iron Age hillfort have discovered it was the political and power centre for the entire Cardiff region. The project’s co-director Dr Oliver Davis said: “Despite its size and obvious importance the site is a bit of an enigma. No archaeologists have ever explored the hillfort and as a result nobody knows how the settlement was organised inside, how long it was occupied, or even who lived there.” But archaeologists have now uncovered a considerable amount of new information including three Iron Age roundhouses and a stone pathway. The team has also recently examined three walls that surround the hillfort. But Dr Davis said these were unlikely to have been just for defence purposes and said they are looking at whether the people who lived there were actually developing their own community. He said the excavations show the site was occupied until at least the third century AD and well into the Roman period and that evidence of life has been found through the discovery of tools and ceramics. The team has also just found a glass bead from the Iron Age and an enamelled brooch from the Roman period. USA – Lake City - Archaeologists have begun looking into whether a site near Lake City contains human remains and artifacts from 8,000 years ago. The Morning News of Florence reported Thursday that transportation department archaeologist Chad Long said the site was discovered two years ago. Long said the site is being studied to see if the deposits need protection. The site contains human remains, ceramic shards and other artifacts, Long said. The archaeologist said the quality of deposits is good because they aren't highly fragmented, and researchers will be able to determine certain time periods when the site was being used. Long says the investigation will take at least 10 more weeks. USA – Philadelphia - This is the Temple University anthropology doctoral student's second summer orchestrating a "public archaeology" excavation in Old City's historic Elfreth's Alley. Kelleher and a crew of volunteers are searching for clues about the lives of 19th-century immigrants, in one of the first projects of its kind in Philadelphia. Ceramic shards, straight pins, and buttons are buried behind the museum around old trinities - three-story houses with one room on each floor, named after the Father, Son, and Holy Spirit. Kelleher said trash from residents of those houses is treasure for archaeologists. When the team unearthed what might be a 150-year-old garbage pit during its second-to-last dig of the summer, it was like finding a pot of gold. Analysis of nails helps date the artifacts. Fancy ceramics in humble immigrant housing is a sign of social mobility. Bones, leftover from meals, show residents' diets. USA - Eppington Plantation - Stories lost to history will finally be unearthed in an investigation of the cemetery at Eppington Plantation. A ground-penetrating radar will be used to locate unmarked graves in the cemetery where one of Thomas Jefferson's daughters and two of his grandchildren are suspected to be buried. Francis Eppes VI began the construction of Eppington Plantation in 1768. Eppes and Jefferson met when they attended the College of William and Mary. Jefferson brought his two daughters to live at the plantation after his wife died in 1782. Now new stories about the two families may be revealed. USA – Lowell - On a July morning in the forest of northern Idaho, Morgan Bingle stood under a tarp sifting soil through a screen and watching history appear as dirt clods disintegrated. Railroad tokens, buttons, shards of pottery and teeth were some of the things found at the site of the former Kooskia Internment Camp, one of two Idaho camps that held Japanese-Americans during World War II. ROYAUME UNI – Scilly - Divers are launching a hunt for historic shipwrecks including one of Sir Walter Raleigh’s ships lost in 1617 off the Isles of Scilly and a paddle steamer sunk off the Northumberland coast in 1838 whose survivors were rescued by Grace Darling and her lighthouse-keeper father. Of myriad shipwrecks off the British coast dating back to prehistoric times, only a handful of sites known to archaeologists date from before 1840 - just 4% of the 37,000 known and dated sites recorded. English Heritage has now commissioned divers from Wessex Archaeology to conduct a survey of some of the oldest sites, and recommend which are of national importance and should be protected by listing. Currently just 47 wreck sites have such protection. The sites potentially of interest were identified in a survey last year. The underwater search will begin in Scilly, where sunken rocks and fierce currents have spelled doom for generations of sailors. Last month a piece of timber was recovered which may be from Raleigh’s ship Flying Joan, one of two lost when a storm scattered his fleet almost before his treasure-hunting voyage to the West Indies began, soon after he put out from Plymouth. In August the archaeologists will be diving at the site where in September 1838 the paddle steamer Forfarshire went down after her steam engines failed, and then lost sails and rigging in a storm, the disaster that made Darling famous. At first light passengers clinging to the deck, including a woman holding her dead children, were spotted by Darling, who rowed with her father more than half a mile through heavy seas to rescue them. Although 42 people including the captain and his wife drowned, the Darlings rescued nine people and were awarded several medals for bravery including the first ever presented by the RNLI, the lifeboat institute. Other sites to be investigated include a possible Tudor wreck near Morecambe Bay, and various 19th-century craft including steam tugs and barges lost in ports and estuaries. ROYAUME UNI – Elwick - An archaeological dig is taking place in Elwick village near Hartlepool to try and uncover secrets of its ancient past. The medieval village established by the Normans around 900 years ago.